On the basis of waveform features and locations, earthquakes in the vicinity of the volcano during November were identified as constituting a separate group. Since September 1998 more than 20 events with magnitudes ranging from 0.5 to 1.0 occurred at shallow depths (<5 km). Information Contacts: Olga Chubarova, Kamchatka Volcanic Eruptions Response Team (KVERT), Institute of Volcanic Geology and Geochemistry, Piip Ave. 9, Petropavlovsk-Kamchatsky, 683006, Russia; Tom Miller, Alaska Volcano Observatory (AVO), a cooperative program of a) U.S. Geological Survey, 4200 University Drive, Anchorage, AK 99508-4667, USA (URL: http://www.avo.alaska.edu/), b) Geophysical Institute, University of Alaska, PO Box 757320, Fairbanks, AK 99775-7320, USA, and c) Alaska Division of Geological & Geophysical Surveys, 794 University Ave., Suite 200, Fairbanks, AK 99709, USA. The Global Volcanism Program has no Weekly Reports available for Ushkovsky. The volcano's 17-km-long Bilchenok Glacier has begun to advance. The glacier, located in Plosky's caldera, has three large ice cascades on its NW flank. Previous surges of this glacier occurred in 1959, 1976, and 1977. Photo reconaissance flights over Kamchatkan glaciers 10-11 March revealed that Bilchenok's front was 1 km from its 1980 position and 500 m from the 1959 maximum surge. Its surface was broken into blocks, and rupture disturbances of the snow cover were observed. Further Reference. 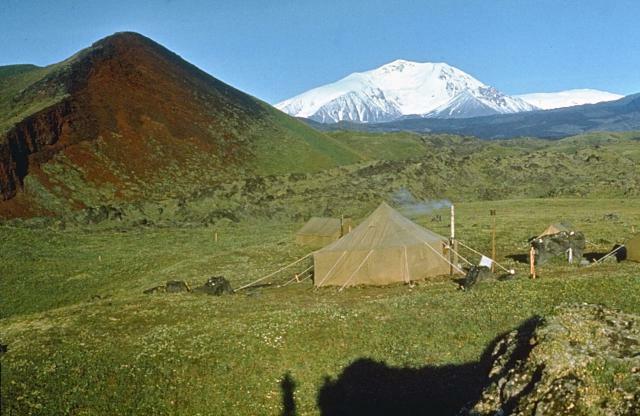 Ovsyannikov, A.A., Khrenov, A.P., and Murav'yeva, Y.D., 1985, Recent activity of the Dal'nya Ploskaya volcano: Volcanology and Seismology, no. 5, p. 97-98. Information Contacts: V. Vinogradov, IVP. Ushkovsky volcano (formerly known as Plosky) is a large compound volcanic massif located at the NW end of the Kliuchevskaya volcano group. It consists of the flat-topped Ushkovsky (Daljny Plosky), which is capped by an ice-filled 4.5 x 5.5 km caldera, and the adjacent slightly higher peak of Krestovsky (Blizhny Plosky) volcano. Two glacier-clad cinder cones with large summit craters form a high point within the Ushkovsky caldera. Linear zones of cinder cones are found on the SW and NE flanks and on lowlands to the west. The younger caldera at the summit of Daljny was formed in association with the eruption of large lava flows and pyroclastic material from the Lavovy Shish cinder cones at the foot of the volcano about 8600 years ago. The only known historical activity was an explosive eruption from the summit cone in 1890. Fedotov S A, Ivanov B V, Dvigalo V N, Kirsanov I T, Murav'ev Y D, Ovsyannikov A A, Razina A A, Seliversov N I, Stepanov V V, Khrenov A P, Chirkov A M, 1985. 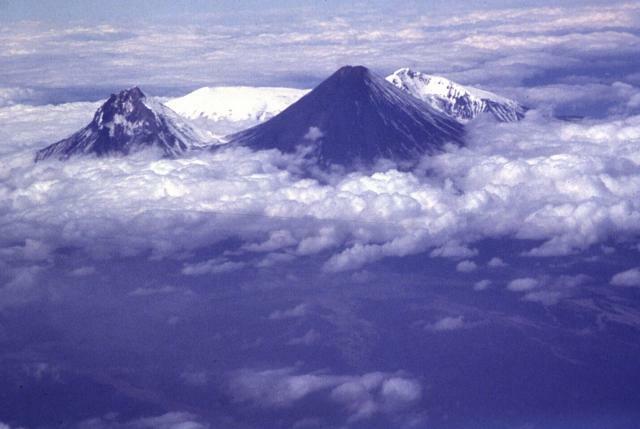 Activity of the volcanoes of Kamchatka and the Kuril Islands in 1984. Volc Seism, 1985(5): 3-23 (English translation 1989, 7: 647-682). Krijanovsky N, 1934. Volcanoes of Kamchatka. Geol Soc Amer Bull, 45: 529-549. Ponomareva V V, 1992. (pers. comm.). There is no Deformation History data available for Ushkovsky. There is no Emissions History data available for Ushkovsky. Four volcanoes of the Kliuchevskaya volcano group are visible in this north-looking view. Steam clouds pour from the summit of Bezymianny volcano (foreground), which is dwarfed by sharp-peaked Kamen volcano behind it. Kliuchevskoi volcano, the highest and one of the most active volcanoes of Kamchatka, is at the upper right. The compound Ushkovsky volcano is on the left horizon, with Krestovsky forming the rounded summit and the glacier-covered Ushkovsky caldera visible at the extreme left. 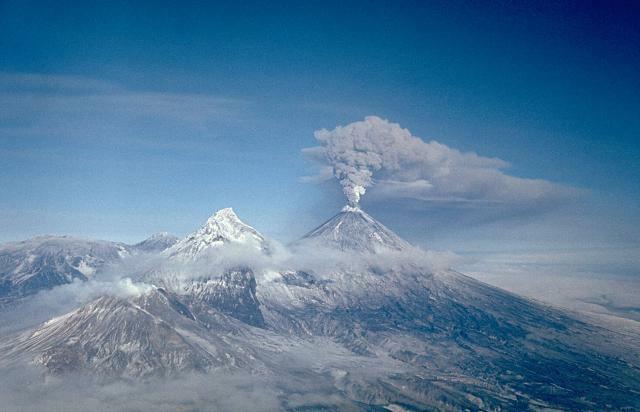 An ash plume rises above the summit of Kliuchevskoi volcano on February 16, 1987. This was part of a long-term eruption during 1986-1990 that included explosive and effusive activity from both summit and flank vents. This dramatic view from the south shows steaming Bezymianny volcano, itself in eruption at this time, at the lower left, sharp-peaked Kamen volcano at the left center, and the broad peak of Ushkovsky volcano on the left horizon. 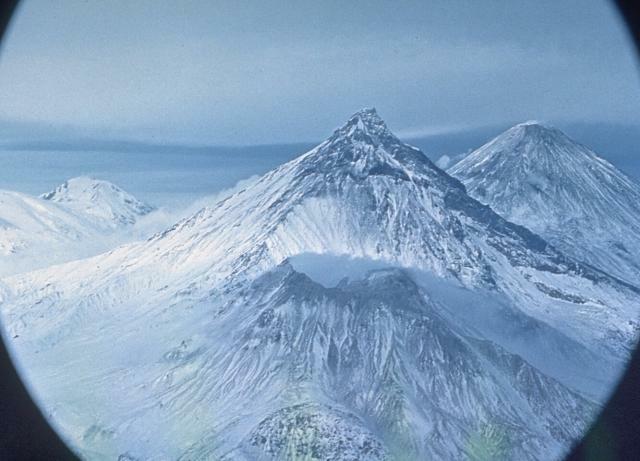 Photo by Alexander Belousov, 1987 (Institute of Volcanology, Petropavlovsk). An ash plume from Kliuchevskoi in 1979 is backlit by the sun in this view looking SW from the Kliuchevskoi Volcano Observatory. This was part of a dominantly explosive eruption that took place from August 1977 until 1980. The eruption concluded with explosive activity and lava effusion from a flank vent during March 5-12, 1980. Ushkovsky volcano (also referred to as Plosky volcano) appears at the right, with the small Sredny stratovolcano in the center. 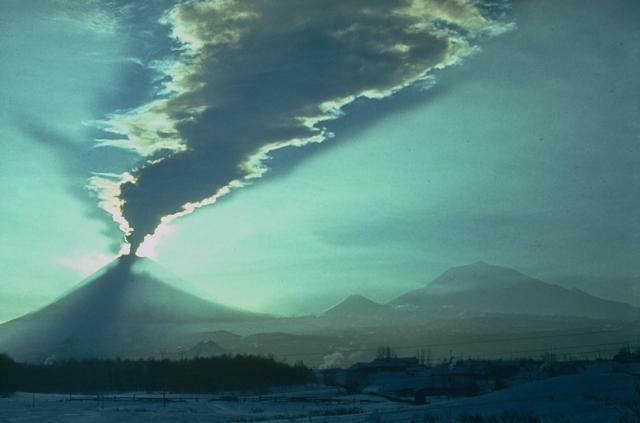 Photo by Yuri Doubik, 1979 (Institute of Volcanology, Petropavlovsk). Clouds drape the margins of the glacier-covered summit caldera of Ushkovsky (Plosky) volcano in the foreground. 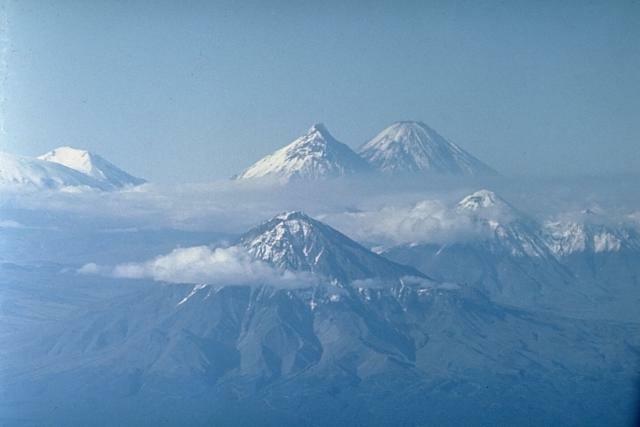 The two highest volcanoes in Kamchatka, Kliuchevskoi (left) and Kamen (right) rise above the layer of clouds to the SE. A small ash plume drifts above the summit of Kliuchevskoi, one of Kamchatka's most active volcanoes. No historical eruptions have occurred from the erosionally dissected Kamen volcano, while a single historical eruption, during 1890, has been documented from Ushkovsky volcano. Ushkovsky volcano (formerly known as Plosky) is a large compound volcanic massif located at the NW end of the Kliuchevskaya volcano group. 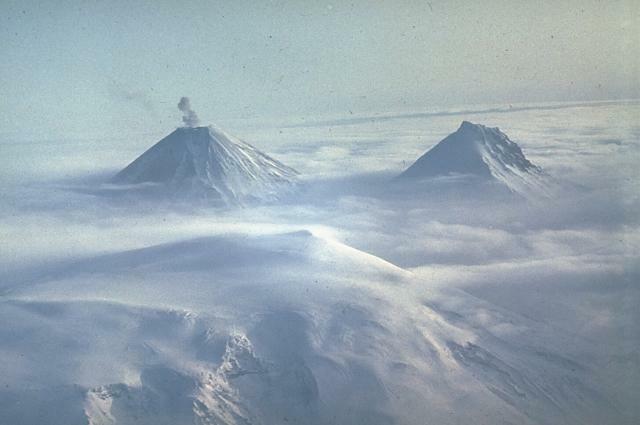 Seen here from the NW, it consists of the flat-topped 3943-m-high Ushkovsky volcano (far right), which is capped by an ice-filled 4.5 x 5.5 km caldera, and the adjacent higher peak of 4108-m Krestovsky volcano (center). Numerous cinder cones dot its flanks. The volcano has been active during the Holocene, with the last eruption of the summit cone occurring in 1890. Photo by E.Y. Zhdanova (courtesy of Oleg Volynets, Institute of Volcanology, Petropavlovsk). 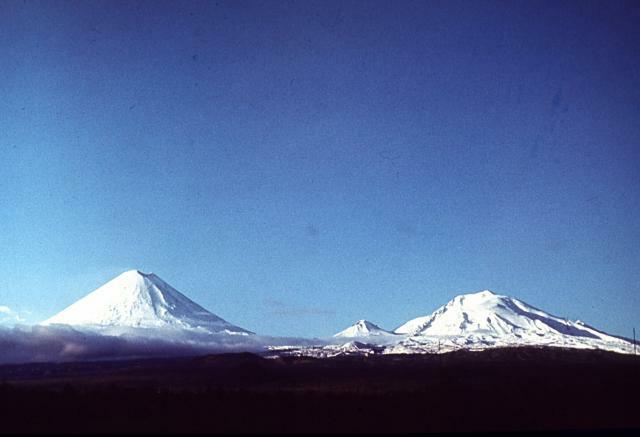 Kamen (left), Kliuchevskoi (right), and the broad snow-capped Ushkovsky volcano behind them to the west, anchor the northern end of the Kliuchevskaya volcano group. Ushkovsky consists of the flat-topped Ushkovsky volcano (Daljny Plosky) on the left, which is capped by an ice-filled 4.5 x 5.5 km caldera, and the adjacent slightly higher peak of Krestovsky (Blizhny Plosky) volcano on the right. Kamen and Kliuchevskoi are the two highest peaks in Kamchatka and Kliuchevskoi is also one of its most active volcanoes. Photo by Phil Kyle, New Mexico Institute of Mining and Technology, 1996 (courtesy of Vera Ponomareva, IUGG, Petropavlovsk). Symmetrical Kliuchevskoi and the erosionally modified Ushkovsky (also known as Plosky) are two prominent stratovolcanoes visible SW of the town of Kliuchi. The small Sredny stratovolcano, constructed on the eastern flank of Ushkovsky, occupies the saddle between them. Kliuchevskoi is one of Kamchatka's most active volcanoes, while Ushkovsky has had only a single eruption in historical time. Photo by Vera Ponomareva, 1975 (Institute of Volcanic Geology and Geochemistry, Petropavlovsk). There are no samples for Ushkovsky in the Smithsonian's NMNH Department of Mineral Sciences Rock and Ore collection. IRIS seismic stations/networks Incorporated Research Institutions for Seismology (IRIS) Data Services map showing the location of seismic stations from all available networks (permanent or temporary) within a radius of 0.18° (about 20 km at mid-latitudes) from the given location of Ushkovsky. Users can customize a variety of filters and options in the left panel. Note that if there are no stations are known the map will default to show the entire world with a "No data matched request" error notice. Large Eruptions of Ushkovsky Information about large Quaternary eruptions (VEI >= 4) is cataloged in the Large Magnitude Explosive Volcanic Eruptions (LaMEVE) database of the Volcano Global Risk Identification and Analysis Project (VOGRIPA).